What Are the Side Effects of Gripe Water in Infants? Gripe water is an herbal remedy touted to relieve colic, as well as gas, reflux and other gastrointestinal problems. While some parents rely on gripe water to help calm and soothe their infant, it's not without its risks, according to a 2004 article in "American Family Physician." 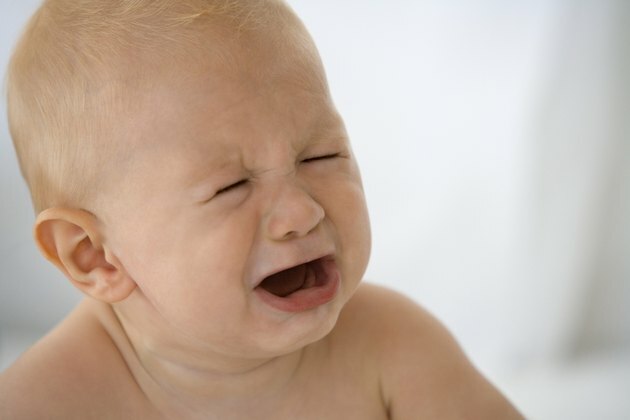 Before using gripe water for your fussy baby, talk with her pediatrician. Once you get approval to use gripe water, look for certain formulations to prevent risky side effects. Gripe water was created in 1851 by William Woodward, a pharmacist with a reputation for providing effective remedies for a variety of complaints, including fussy babies. The original formulations of gripe water contained alcohol, sugar and herbs such as dill, cardamom, cinnamon, clove, fennel, ginger, peppermint and yarrow, according to the "American Family Physician" article. The inclusion of alcohol prompted the United States to ban gripe water in 1982. That doesn't mean that mothers can't use it, however, because gripe water is readily available online and in newer formulations that don't include alcohol or sugar, the editors of the book "The Babytalk Insider's Guide to Your Baby's First Year" report. One reason why gripe water might be so effective at calming fussy babies and easing tummy troubles is because the original formulation contained alcohol. In fact, according Dr. Ivan Blumenthal, in the "Journal of the Royal Society of Medicine," gripe water was 3.6 percent alcohol, so a baby weighing 8.8 pounds and given the recommended dose would be consuming the equivalent of 4.25 ounces of whiskey. That much alcohol had the side effect of knocking a baby out. Herbs and herbal remedies are not regulated by the U.S. Food and Drug Administration, meaning that gripe water formulations haven't been deemed safe or unsafe by the FDA. Side effects of the herbs in gripe water can range from mild stomach upset to a serious allergic reaction. Further, the benefits of gripe water are thought to come from the sweet taste it has rather than any of the herbs it contains, according to Blumenthal. If you're interested in using gripe water, always talk to your baby's pediatrician before giving it to the child. Don't purchase gripe water from Internet sources that aren't reputable, and don't make your own version at home either. These aren't approved for use in babies in the United States and could be more harmful than good. If your doctor approves your use of gripe water, purchase blends made in the United States that don't contain alcohol or sugar. Ask your child's pediatrician about alternate ways to ease colic or tummy symptoms because there is no guarantee that gripe water will work for your little one.